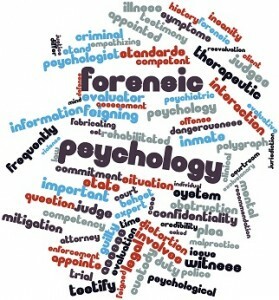 Forensic psychology is the application of psychological principles to the justice system. For example, forensic psychologists may be concerned with topics such as the accuracy of eyewitness testimony, competence to stand trial, workplace discrimination, child custody disputes, brain abnormalities, and insanity pleas. Although each state has specific requirements to become a forensic psychologist, all states require certification or licensure to practice. All states require some form of certification or licensure to practice as a forensic psychologist. Individuals should examine the specific requirements for the state in which they plan to practice as early as possible in their academic career. Certification is not required to practice as a forensic psychologist. However, most individuals will choose to apply with the American Board of Forensic Psychology (ABFP) after receiving their doctoral degree in a psychology program. The Diploma in Forensic Psychology is the only post-doctoral certification recognized by the American Psychological Association. Learn more about how to become a forensic psychologist. Average timeline to earn a bachelor’s degree in forensic psychology is typically 4 years. Every graduate program has a variety of psychology prerequisites all accepted students must complete prior to enrolling. Failure to complete these perquisites often causes students to be rejected by grad programs, or they will be required to complete missing courses before enrolling. Because of all the psychology prerequisites, many undergraduate students choose to major in psychology. Alternatively, students often choose a major that compliments their psychology major or is well-suited to their graduate program. For example, forensic psychology graduate students may major in criminal justice or neuroscience as an undergraduate. Examples of Psychology electives may include: Personality psychology, educational psychology, evolutionary psychology, or other special psychology topics. General coursework in other areas, such as math, science, art, composition, and literature should also be considered. Average timeline to earn a master’s in forensic psychology is typically an additional 2-years. One major difference graduate students often notice is that they are only required to take courses in their focus area, and do not need to take general electives. This is because graduate school is aimed to prepare students for their specific careers. Taking additional courses in psychology will further expand a student’s knowledge and help gain valuable insight into relevant areas of opportunity. Earning a doctorate in forensic psychology can prepare students to become a forensic psychologist or college professor. Getting a doctorate in forensic or child psychology takes a minimum of eight years—four years of an undergraduate bachelor’s program, and four-to-six years of doctoral study. Many students choose to earn their master’s before their Ph.D., which can add another two years. Students may also complete a short paid position after their doctoral program, called a postdoctoral fellowship (or “postdoc”). Students who choose to earn their doctorate in forensic psychology will take many more specialized classes than when they earned their undergraduate degree. A series of statistics classes—each statistics class is focused on one concept, such as ANOVA, multivariate methods of analysis, or psychometrics. Advanced neuroscience classes, which focus on the structure and functioning of the brain. Other specialized topics depending on the student’s degree focus. For example, a student studying forensic psychology may take courses that focus on early childhood development, adolescent development, intelligence test administration, and/or clinical forensic psychology. It is important for any doctoral program to be accredited. In addition to the college or university having accreditation overall, doctoral programs can also seek accreditation by the American Psychological Association. APA accredited programs. Online degree programs in forensic psychology examine behavioral and social science. They are available at the bachelor’s degree, master’s, and doctoral** levels. Although admissions requirements vary by school, many online programs in forensic psychology require minimal time spent on campus, or require internships. Most require, at minimum, a bachelor’s degree, experience in a related field, and at least two letters of reference. It is important to note that there are very few online options for graduate students. ** There are no doctoral forensic psychology programs accredited by the American Psychological Association (APA). Campus-based programs offer the opportunity to study face-to-face with leaders in the field. For many students, on-campus learning is necessary for disciplined study and interaction with other students and professors.